I love that this is so easy to do and easy on my wallet. Target has a ton of cute options that are super cheap, and basic bottoms are always affordable and easy to find. If you find a bikini top on sale, as long as it goes with your basic black bottoms, you don't have to worry about buying matching bottoms. What type of bathing suits are you sporting this summer? 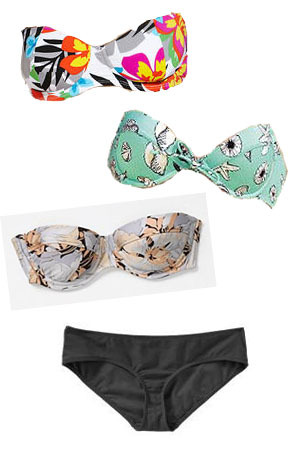 Do you mix and match your tops and bottoms? These are all really cute! 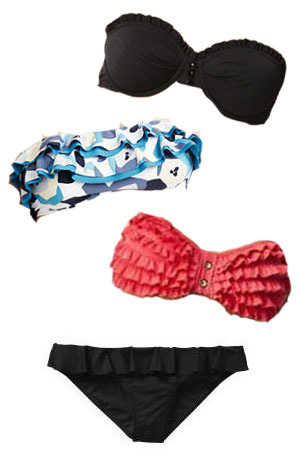 I like bandeau tops too, as I'm not working with much up top. :) I, unfortunately, didn't quite get rid of my muffin top this year, so I'm gonna be rocking a one piece (from Target) haha! these are fab options! thanks for sharing! I, also, am a bandeau only wearing girl. Lovvvvve all of the ruffly ones you picked out! Very cute! I actually just got 3 lilly pieces on sale.. I am mixing and matching them. How cute are all of these!